Our local Greek restaurant has a really nice hot chilli sauce that they provide with dinner. You can also buy a bottle to take away. Sunday I decided to cook some Chilli. Grabbed some minced beef, white beans, kidney beans, chopped tomato, Tabasco, onions, garlic and Bonafacio’s Revenge extra hot chilli sauce. Simple recipe, basically toss it all into the pan and cook. Done. I served it with some pasta elbows. The Bonafacio’s Revenge is described as XXXtra Hot – and it is. 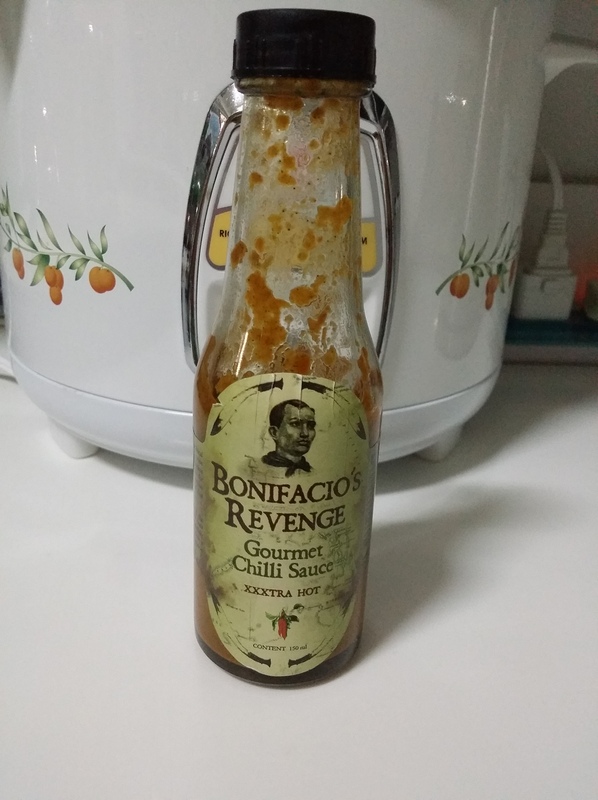 Apart from being one of the hottest chilli sauces I have had in my time, it is also one of the best. And the Chilli itself? The food critic gave it a 10/10. On the way back from the wargame last night, the topic of dinner came up. The lady was looking for Korean first or mussels second. Our favourite Korean restaurant was full so mussels were then Plan B. 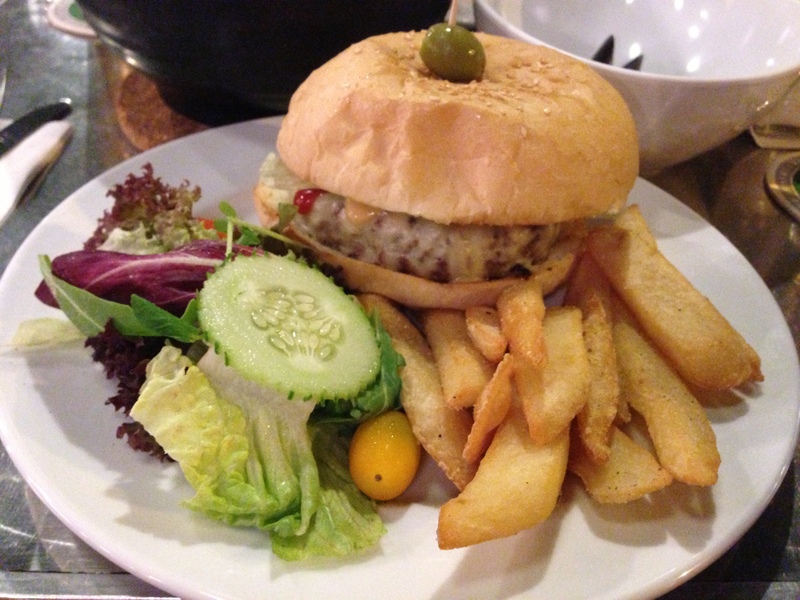 We stopped into the New Harbour Cafe and Bar on Tanjong Pagar Road where I had a chance to savour a cheeseburger. The New Harbour is a big cheeseburger with minimal inclusions – a piece of limp lettuce, a slice of tomato and a slice of cucumber. The beef patty however is reasonably seasoned and more importantly, big. The cheese is melted to the patty and the bun is strong enough to last the burger through. The burger itself is fine and filling but not great. It weighs in at about $16.00 and on the modified Thomo Cheeseburger scale, I’d rate it a 6/10. I really must put the scale up here at some point in the future. I’ve been on a diet. Yep, Thomo has been trimming down. My first target is to be overweight and in this I am being slowly successful. I only have about 300 grams to go to be overweight. The diet has been to quit alcohol (with the exception of the very occasional shandy) and eat at least one cheeseburger a week. Today, for lunch, I needed to head to Chinatown Point here to grab some stuff from the Daiso (the $2 store) and thought I would lunch there. There seemed to be at a table free at Food Garage so I wandered in. There was a cheeseburger there for $14.50 so burger it was. Meat patty was well cooked but still juicy. Sesame seed bun, a reasonable cheese, ketchup, two types of shredded cabbage, onion and tomato. A generous burger for the price and good overall flavour. I’d have to call this at about 7/10. Certainly good quality for the money. The Gun Bar Burger – sweet! Anthony decided to experiment on Saturday before the French-Indian Wars Big Battle and in an effort to become more acquainted with his barbecue, decided to experiment with a burger. This was partly because of my previous burger posts and partly because he also likes a good burger. Now, where there is a barbecue involved and the end result is a burger, Thomo is happy to be experimented on. Given the pursuit for the perfect burger in Singapore (and other locations as well it seems), the first bite of any burger needs to be reported on! A hand-made beef patty lightly seasoned and pressed with care provided the core component of the burger. Taking flavour from the barbecue enriched the flavour. The cheese added to this burger was Brie which provides a nice depth of flavour to the burger. Add tomato, lettuce and onion and the burger provided an excellent meal – and certainly sustenance enough for me to fight the dastardly British to a standstill in North America! Overall, I reckon this was the standard of a good burger – 7.5/10. Future burgers will need to work hard to taste better. I had a burger today and decided that I should include travelling burgers as well as just those in Singapore. This then is the first of the Jakarta burgers. 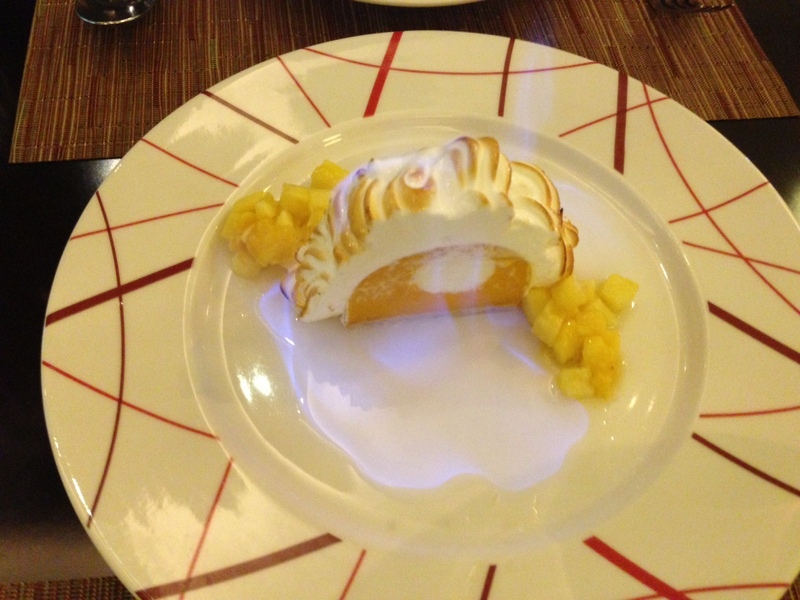 I had it at the Park Lane – an older 5-star hotel. The burger I would rate as a 4/10 2/10 [it was noted to me by Dr Dan that 4/10 was just below average whereas 2 or 3 out of 10 was awful – leaving 0 and 1 out of 10 for the absolutely dreadful]. It was kind of dry and the beef bacon was chewy and did not have a good texture. The patty was beef but had just the minimum of seasoning and little in the way of extra flavour. There was something that looked like a peppery thousand Island dressing so I asked for tomato ketchup. The tomato, and lettuce was limp – the tomato looked like it has been sliced yesterday and left out of the fridge. The onion still had one layer of skin around the outside. I avoided the pickle altogether and never noticed the mushrooms under the cheese until just now, looking at the picture again. Overall, this is perhaps the worst burger I have had in the last 12 months with the possible exception of one at the Bull and Bear in Singapore where the centre of the meat patty was a lump, as if minced meat had been minced then squeezed together and frozen then not properly thawed. Today’s burger was enough to turn me vegetarian – quick, give me a salad! We had just come back from lunch at the Taphouse and had spent a couple of hours chatting and taking over coffee. We were hungry again and as we were near Scott’s Plaza we decided that we would try what looked like a French Bistro. They made other stuff as well, like a steak but all Thomo noticed was that they made burgers. You may remember that the lady took me to db bistro moderne in Marina Bay Sands, a restaurant by chef Daniel Boulud, another Michelin Starred chef where I had for a Birthday Dinner – the $42 Burger. I was not so complimentary on that burger. However, chef Bruno Menard’s burger was the business. 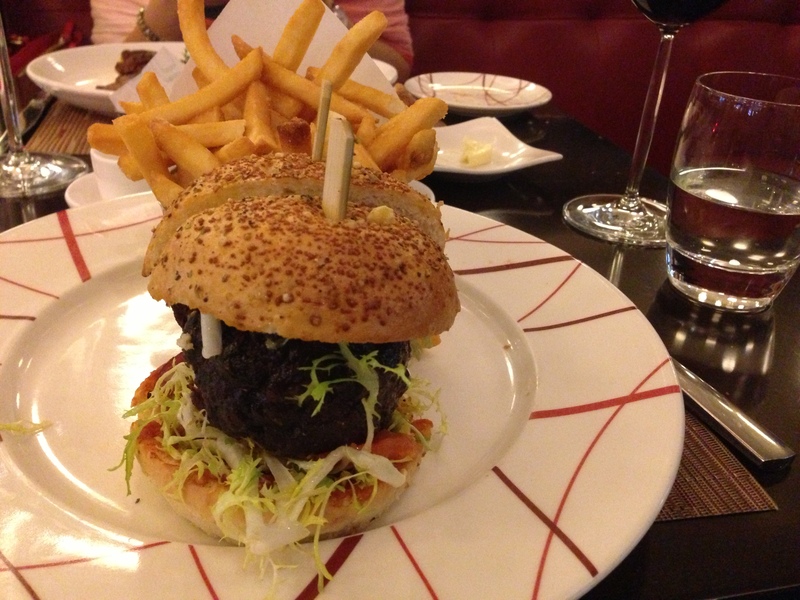 For a start, the cost was $19 which compared very favourably with the $42 at db bistro moderne.The burger itself was well cooked and the presentation, whilst simple, was appealing. I was hungry and managed to demolish the chips before I managed to remember to take a photo. 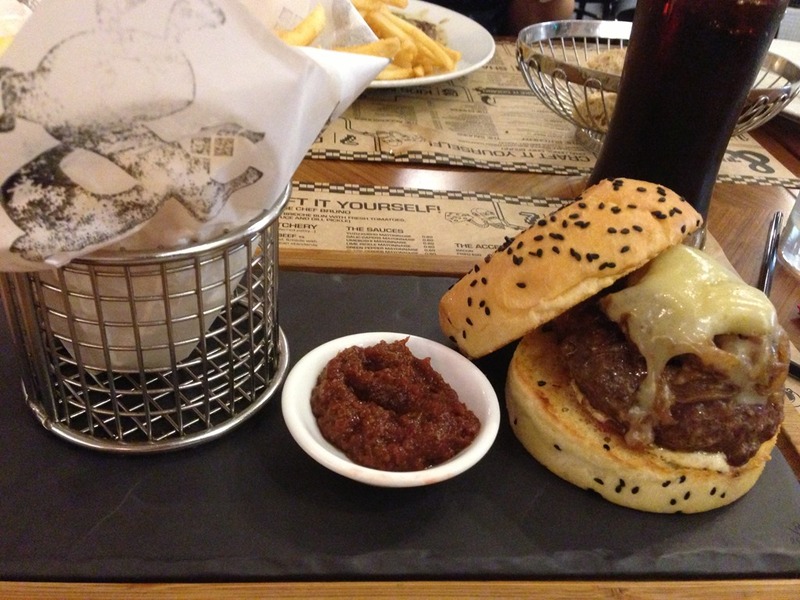 The burger itself consists of a beef patty made with dry aged beef, caramelized onion, French Comte cheese, and a caper and garlic mayonnaise. It is served with a tomato relish. The burger was delicious. The patty was juicy still and the bread was a treat. I would certainly rate this burger up there with the ones at Two Blur Guys in Tanjong Pagar ((I’m sure I reviewed those burgers here somewhere before but I’ll be dashed if U can see the review)). I ate at Bergs Burgers the other day – the Bergs Cheeseburger was the fare of the day. The burger costs $13.00 and for a few dollars extra you can add a soft drink and a few chips. 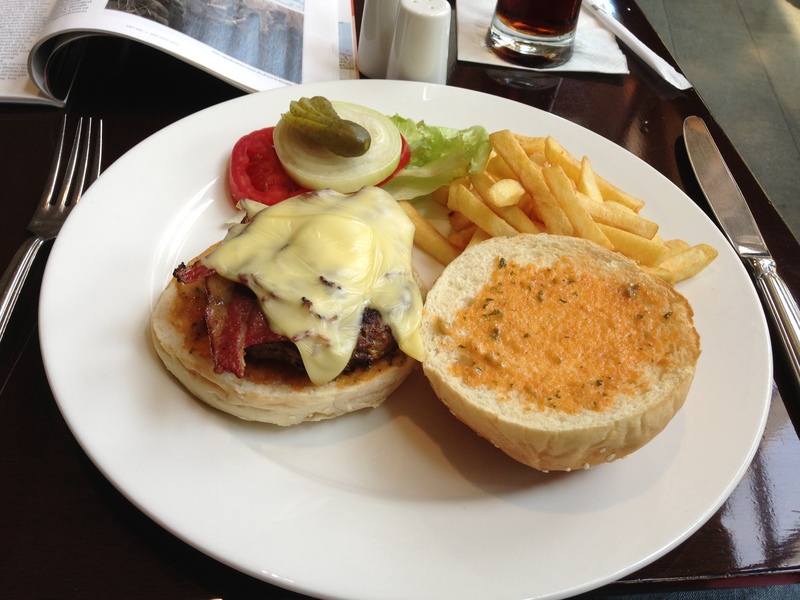 One of the nice things with the Berg’s burger is that you are asked whether you want Swiss, Blue or Edam cheese. For my burger I took Edam. Berg’s serve their burger in a paper bag and what more could you ask – perhaps the best way to serve a burger and no washing up afterwards. 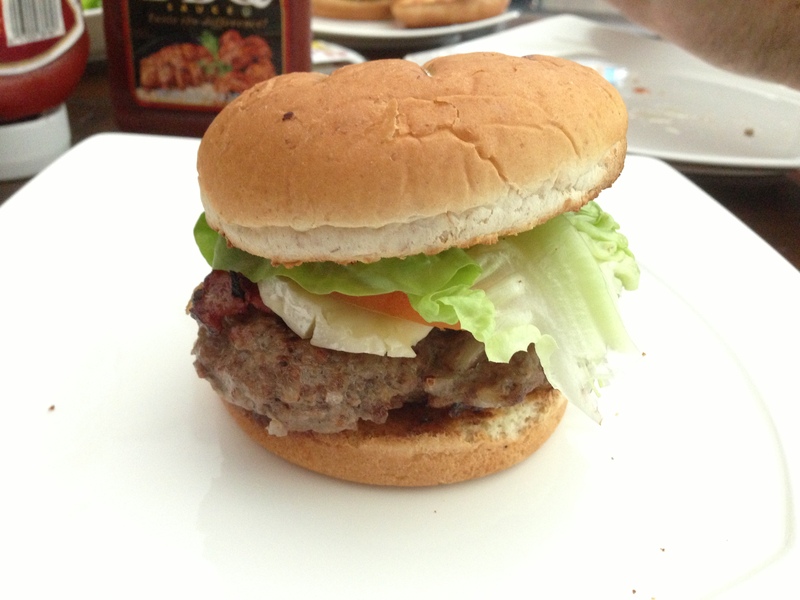 The meat in the burger is well ground beef and very tasty. It is lightly seasoned. Where Berg’s do well is with the construction of the burger. The meat patty is juicy to the end and the bun is tough enough to take that juice until perhaps the last two or three mouthfuls. It doesn’t fall apart. The burger itself is constructed with lettuce, tomato, onion (I’m missing my beetroot) and added to the burger is an aioli that is rich in garlic – so perhaps not the best burger for lunch. A beer is also available at Berg’s. They are located at two locations in Singapore. 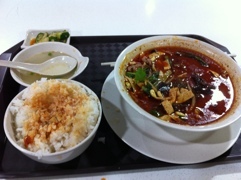 I ate at the one at Far East Square, 137 Amoy St, #01-01 Far East Square. They offer a range of Burgers (including one of my favourites, the Budgie Smuggler). 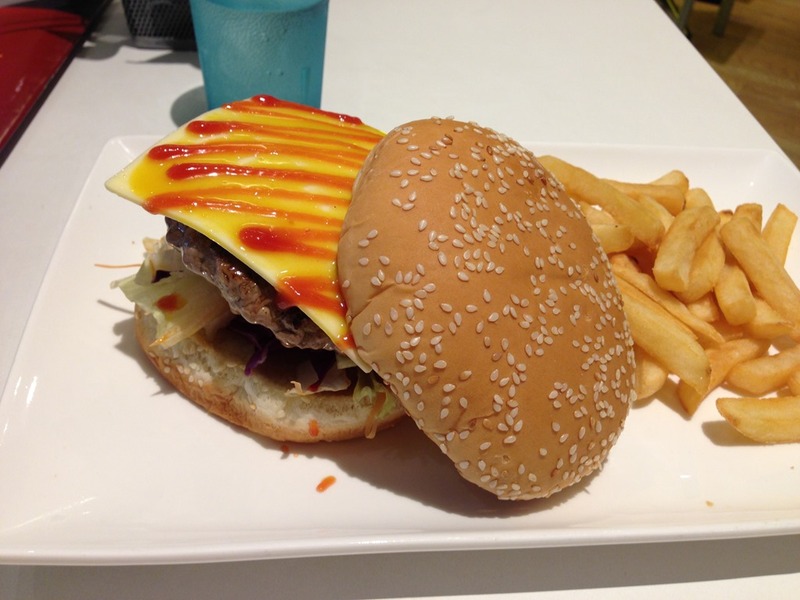 I’d have to rate the Bergs Cheeseburger an 8.5/10 … maybe a 9! It is a very nice burger and it will be hard to find something better here I think. Those that know me know that I am a man of simple tastes. No pheasant under glass, no duck l’orange, no foi gras for me, no sir. Give me a burger and I am gastronomically happy. I once told a friend of mine in Seoul, the then executive chef at the Seoul Renaissance Hotel, that you could always tell a great chef from the simple meals. Any cook can usually manage a complicated dish and give it a good showing but a truly great chef can take the simplest of meals and make them superb. He then proceeded to cook me the best burger I had ever had up until that time. Later, I spent some time in Mongolia and went on the hunt for the best cheeseburger in Ulaanbaatar. The echoes of that hunt can still be seen at Thomo’s Cheesburger Page. I’ve been around Singapore for nearly two years now and have managed to eat a few burgers and commented on the odd one or two. Today I got to thinking that perhaps I should start the review again so here it is, the first of Thomo’s Singapore Burger tastings. Before I start on the burger, I should note that a beer is the perfect accompaniment – a good, cold, fresh lager I think is best. Even better is if the burger and beer can be consumed whilst there is a football match being played although that is optional. I should also note that I am in the process of actually trying to shed a kilo or 10 so to that end, I am quitting drinking beer for a month (yes, skipping Christmas but back into it for New Year). Burgers are, of course, healthy, containing as they do carbohydrate, protein and vegetation. The first burger to come under the microscope was from Saturday night. We had been to see Skyfall (thoroughly recommended – classic style Bond) and the Cathay Cineleisure was full of pre- and barely pubescent individuals so we started hoofing it around town after the movie. We ended up in the Dôme at Shaw House, 350 Orchard Road, Level 4 Isetan Scotts Shaw House, Singapore. I think the Dôme is actually a West Australian organisation but I am happy to be corrected on that. The burger came and is illustrated in the photograph. 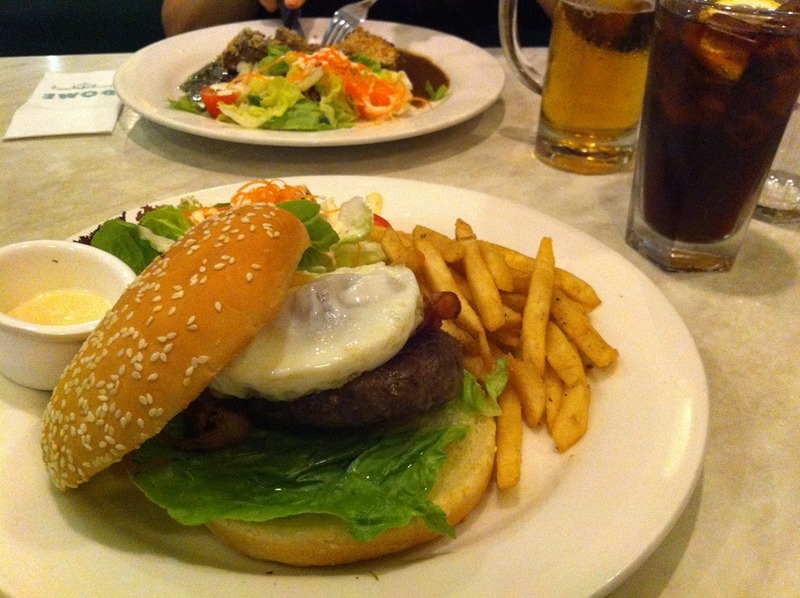 Sesame seed bun,fried egg, beef patty, limp lettuce (although the salad served on the side was very crispy and fresh), slice of tomato and sides of chips and salad with some mayonnaise to dip the chips in. The cost for this is S $15.90 (plus service and tax) – about US $13.00. The burger itself was very pleasant. There was nothing outstanding about it, it was a workmanlike effort. The beef patty was good quality, well seasoned and with a pleasant flavour. The bun held together for the whole burger but was not hard and the egg and tomato added some more layers to the overall flavour. I think it is a little overpriced at S $15.90 but I suspect part of that is paying for the Dôme experience itself. 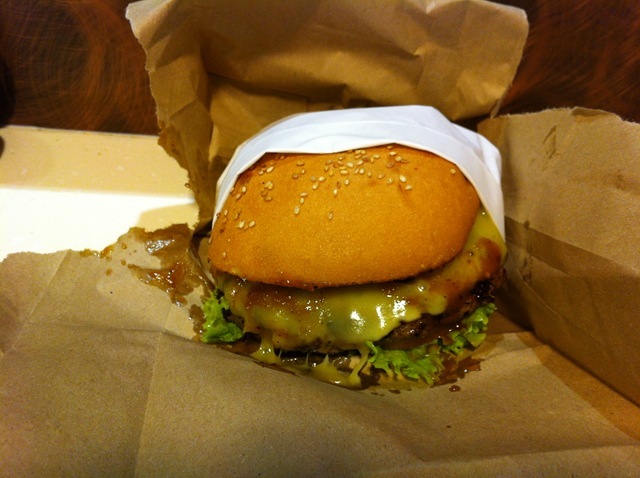 Overall (and this burger becomes the Singapore benchmark), I’d rate this 7.5/10. It was a beer night so coming home I felt pretty good although a little hungry. We were drinking at a Belgian bar so it was beer and chip only earlier. I figured that a hot chilli type soup would go down a treat and help ensure I felt pretty good the next morning. Leastwise it had always worked that way when I worked on Korea. I stopped at the local hawker stalls here and found a boiled beef soup. It was beautiful, just what the doctor ordered but my goodness, it was a hot one. Even my top lip was sweating. Mind you, I feel great this morning.